Ideally situated, Barbican House overlooks the famous Medieval City walls and is a 10 minute stroll to all City centre attractions. You can leave your car idle in our floodlit car park for the whole of your stay. We are close to some of the best restaurants and pubs in town. York University is only a 15 minute walk away. Guest are invariably delighted that they found our Guest House, partly because of the convenience of being so close to the town, but more so because of the charm of this residence and the high standards we maintain. We are pleased to have been awarded four diamond and a Silver Award by the English Tourist Board. 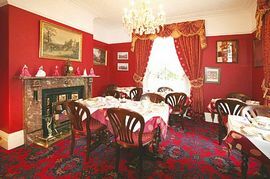 A full English breakfast is served in our elegant dining room. Vegetarian or alternative breakfast menu is readily available and we always have a fresh fruit platter, yoghurts and muffins. Overlooking the famous Medieval City Walls, All rooms en-suite. Special Diets Provision: Special diets are catered for. Vegetarian option available. Once on the A59, ignore signs directing you to turn left for York City. When you reach Blossom Street, turn left and then right at Nunnery Lane. Turn left onto Bishopgate and keep on the main road with the City Wall on your left until you reach Paragon Street and the front of the Barbican Leisure Centre. At the the corner of Paragon Street and Barbican Road, turn right and you will immediately see Barbican House. Once on the A64, keep on that road until you come to the SELBY and YORK A19 slip road (don't follow the 'A19 - THIRSK' sign which is before the SELBY sign). Once on the A19 proceed north passing through Fulford and look out for the Army Barracks on the right. Then follow the fork right sign for Barbican Leisure Centre. This will take you along Cemetery Road. The name changes to Barbican Road after the first set of traffic lights. The Barbican House is approximately 100 yards further on and is on the right hand side immediately before the next set of traffic lights. 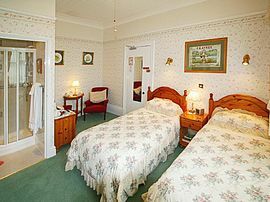 Double and Twin rooms from £74 to £90 per night with full English breakfast for two included. 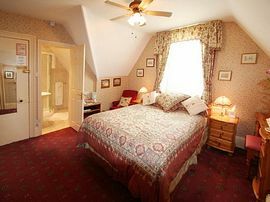 Family room suite sleeps 3 is £110 per night. 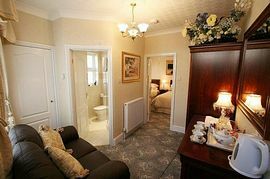 Single person reduction of £10 per night except weekends and special events. 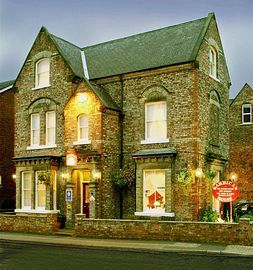 Christmas and New Year £90 to £120 per night for a double or twin room with full English breakfast for two included. Minimum two nights stay required at weekends and special events.